Many years ago, on a suggestion from Marine Band tubist John Cradler, I wrote a quirky collection of tunes set in the lower register of the tuba That book, published in 1991, “mimics to be popular beyond my wildest dreams with players of all age levels and ability. Its success exposed a void in studies with actual music in the extreme lower part of the tuba range, a part of the instrument that is so important in the music of Prokofiev, Wagner and other composers. The ability to read notes (on sight!) of 4 and 5 ledger lines had only been previously addressed with repetitive exercises and academic method books. The embarrassing gap between that first volume and today’s long-awaited and requested second book is only the fault of yours truly, who until recently didn’t think there was a sincere desire for a second book. When I did decide to start writing, I was conflicted over which direction to go: Low Vol. 2? Low(er!) Etudes? Higher Lyrical? Orchestral Excerpt-Based Etudes? Duets? I finally decided on this combination of Lou/(er!) Etudes with accompanying duets that give the player a break from the ultra low writing, and provide a chance to revisit the well-loved tunes of the first book with fresh harmonies. I hope you enjoy what I’ve finally come up with and accept my apologies for taking so long to do it! My sincere thanks to tubists everywhere for making these tunes part of your music-making over the years. This long-awaited Low(er!) Etudes for Tuba includes more of the melodies Phil Snedecor is known for composing. Always harmonically fresh and melodically surprising, these tunes pose challenges beyond the ultra low notes and offer new discoveries upon each reading. 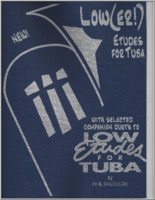 Also included are companion duets to the original Low Etudes for Tuba. A great book to keep on the music stand in your studio! “Low( er!) Etudes is a fresh take on the winning concept that made the first volume successful: Applying brilliant artistry and musicianship to ALL registers. These studies aren't just fortissimo practice, they are a rare chance to show a kaleidoscope of emotions and develop nuanced musicality in the low range. Auditioning tubists take note! You are likely to encounter these etudes on your next band, orchestra, or college audition." “This book represents a new level of challenge and achievement for amateur and professional tubists alike. Pushing us to our lowest limits on the horn, these etudes force us, at the very core, to remain musical, despite the technical hurdles. Phil's second volume will definitely take a lot of time to master, but the rewards to your playing will be immediate."